Somewhere in between busy schedules and important phone calls, children can sometimes feel pretty insignificant. Even the best parents can fail to articulate how very precious their children are to them. It is really important that kids know they are valuable and loved. 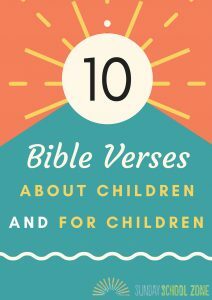 God’s Word is filled with lots of meaningful verses about children. We have listed ten of them here for use with your kids. When kids become familiar with the following verses, they can deepen their appreciation of their own worth. Memorizing these rich verses will help children learn their important role in the kingdom of God. When children know they are important, they feel confident enough pursue God’s will in their lives. Self-assured kids will follow through on clear objectives to make an impact in their own lives and the lives of others. Today’s young Bible students are tomorrow’s church leaders. Let’s make them great! You can see a list of all of the articles Kim has written on Sunday School Zone.